There are always new, creative ways to make money from your greenhouse or garden. Baking pies with fruit from your own garden is not new but . . .
Are pies the new cupcakes? For any of you who are fans of the Food Network and their many cupcake and cake decorating shows and challenges, is it time to jump off that bandwagon? Whenever anything becomes so popular, you know it’s only a matter of time. I mean, turkey and cranberry cupcakes – really. When the New York Times and CNN start talking about what’s new, maybe it’s time to listen. Apparently there are new pie shops opening all across the country. What can you grow in your greenhouse or garden that would make a great pie filling? Be creative. Even if you live in a part of the country that prefers the old tried-and-true, give it a twist. What about apple pie with cheese baked right in with the apples or baked into the crust? Or apple pie with caramel. What about apples and chiles like Trevor Logan does in his Green Chile Kitchen in New York and now his Chile Pies and Ice Cream in San Francisco. Or you might have an avocado tree gone wild in your yard. For those of you fortunate enough to have your own tree, you know how prolific they are. When I used to have one, my neighbors would line up at the door with their baskets. 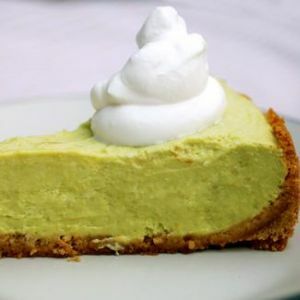 Here’s a wonderful recipe for an Avacado Pie from Clay and Zach’s The Bitten Word blog. The idea is to come up with two or three pies you can create and make your own. Work the recipes until they are 6 stars out of 5. Be the best! With the trend toward quality and freshness today, you could be the next big thing. Organic pies. . . yumm. Next post: Growing potatoes in old tires – a bad idea.